Microsoft has released Skype for Windows Phone, now you can download the latest version from the Windows Phone market place. 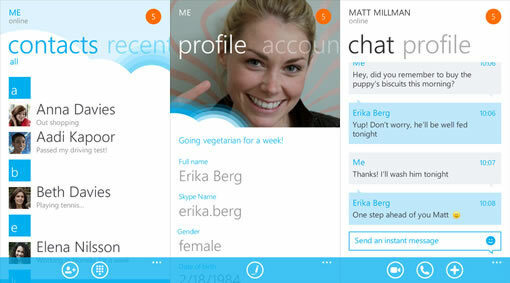 Skype for Windows Phone Beta was released in February during Mobile World Congress, at that time Microsoft has promised to deliver the final version by April and so here is the first final version of the app for WP. According to Skype blog the latest version brings some new features including video calling in portrait mode, friend management capabilities including invite, accept, block and unblock contacts. Skype for Windows Phone supports 18 languages. There are some limitations also for the app including Skype has to be in the foreground to receive calls, background call support is still not implemented. This is due to “a combination of how Skype works and how the Windows Phone OS works.”, Skype spokesperson told The Verge. To use Skype app on Windows Phone you need atleast 512MB of memory, that means Lumia 610 won’t be supported as it will come with 256MB of memory. Skype for Windows Phone will get deeper integration with Windows Phone 8 “Apollo” when it is released to the public, hopefully some of the issues that are there in the current version will be addressed at that time. Via Big Blog, Skype Garage, The Verge.